It's a while since I shared my first novel - a spanking romance set in an equestrian centre in New Zealand. So for today's Saturday Spankings I decided to bring back Anna and Jeremy. In this scene, the horse Anna has been training is in her maiden race, with jockey Josh on board. “Go Star! Go!” she screamed from the sidelines, clutching at Jeremy’s hand, squeezing it with a superhuman strength that made him wince. “Go!” she screamed again, wild with excitement as the horse continued to gain speed, overtaking horse after horse as they raced towards the final corner. The gap between Star and the leader was lessening at an incredible rate as the horse streaked down the track, every muscle in her body working hard to propel her onwards. “Come on Josh, keep at it boy!” her father yelled, pumping his fist into the air. “Don’t fall off Josh!” was Jeremy’s quiet contribution, before he, too, got caught up into the excitement, yelling and cheering alongside Anna and the rest of Starlight’s supporters. 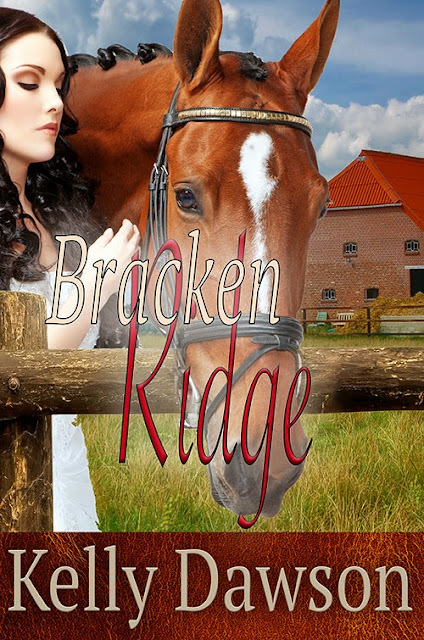 Blurb: When Anna Fletcher comes home from University back to Bracken Ridge, the equine centre where she grew up, she is stunned to find Jeremy McCrae working as the manager. They were children together and she has had a crush on him forever. The years she's been away, Jeremy has only gotten cuter. Anna has plans for Bracken Ridge, but before she can implement them, she needs to prove herself. The biggest obstacle in her path is her nemesis, the stable hand who thinks Jeremy is mighty fine. Once Anna gets past her, Jeremy is standing in her way - he's now the boss, but she can't work for him. He's been her best mate forever, and to cede to his authority now is going against every grain of her nature. Being the daughter of the owner, Jeremy isn’t allowed to fire Anna, so when she gets rebellious and sassy he decides to spank her instead. Can Jeremy tame Anna's rebellious spirit before it is too late? Exciting snippet that had me cheering for Star too! And the blurb, very intrigue. Nice post, Kelly. I'm with Maddie, on this one. The excitement of a maiden race is exhilarating, and you captured it beautifully. I loved how you captured the excitement too Kelly and was also cheering Star on. Great snippet, Kelly. Looks like a big change is coming in her relationship with her 'best mate'. Terrific snippet Kelly. Love this book.